Virtual romance becomes a terrifying obsession in Want You Dead . . . Single girl, 29, smouldering redhead, love life that's crashed and burned. Seeks new flame to rekindle her fire. Fun, friendship and - who knows - maybe more? When Red Westwood meets handsome, charming and rich Bryce Laurent through an online dating agency, there is an instant attraction. But as their love blossoms, the truth about his past, and his dark side begins to emerge. Everything he has told Red about himself turns out to be a tissue of lies, and her infatuation with him gradually turns to terror. Within a year, and under police protection, she evicts him from her flat and her life. But Red's nightmare is only just beginning. For Bryce is obsessed with her, and he intends to destroy everything and everyone she has ever known and loved - and then her too . . . I believe by reading the synopsis help you visualise the story. It is about a girl named Red who seeks a love from an online dating site and finally met someone who caught her heart. They were so in love with each other until one day they broke up when the truth about Bryce has been revealed. He is actually a freaking psycho. Everything he told to Red was all lies. Red then met her new boyfriend but sadly he is being murdered. Her life turned into a nightmare when everything that she loves is suddenly burned down to ash. Even though I know the novel is a fiction, but I learned that dealing with a psycho is hell difficult! That person won't let you go until they get what they want from you regardless whatever it takes. You will live in a constant fear. As for Bryce, he knows how to get his way to stalk, to spy and to scare Red. If you read this book, you would know how insane he is!!! I love the part when Bryce monologue to himself. His words will absolutely give you goosebump and chills! Trust me, this book is interesting and not boring at all. 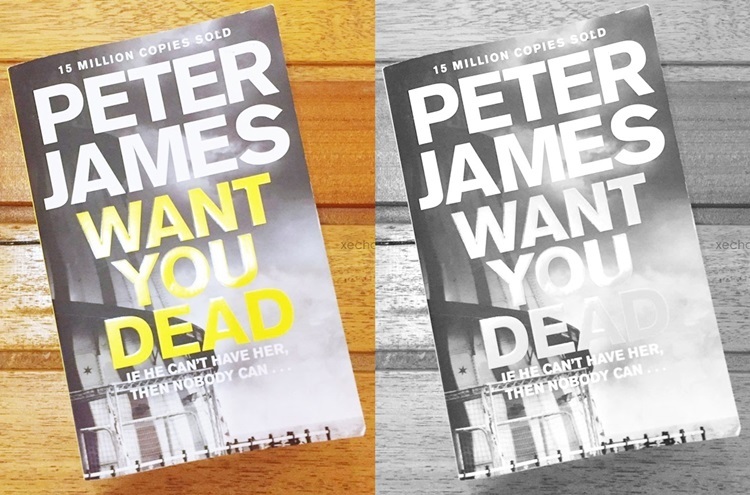 This is my first time reading Peter James' novel and I would like to say that he knows how to excites his reader with his words. The English words are not complicated at all and I would recommend you to read the book if you are into crime genre! As someone who is really into a stationery stuff and a notebook, I am feeling extremely happy to get my new planner which I have long for all the time. I was actually in a long hiatus from planner world because I realised I had spent too much on stationery lol. I didn't follow any online shops that sell beautiful planners, pens, stickers and washi tapes etc anymore. But you exactly know what your heart wants don't you? It will keep bothering you until you get the thing you desire. That happened to me! After making a hard decision, I finally decide to buy a new planner and promise to myself that that will be a pretty last one. Hopefully! I am actually feeling guilty to myself cause I paid few amount just for planner/organiser lol. So this is my new planner! 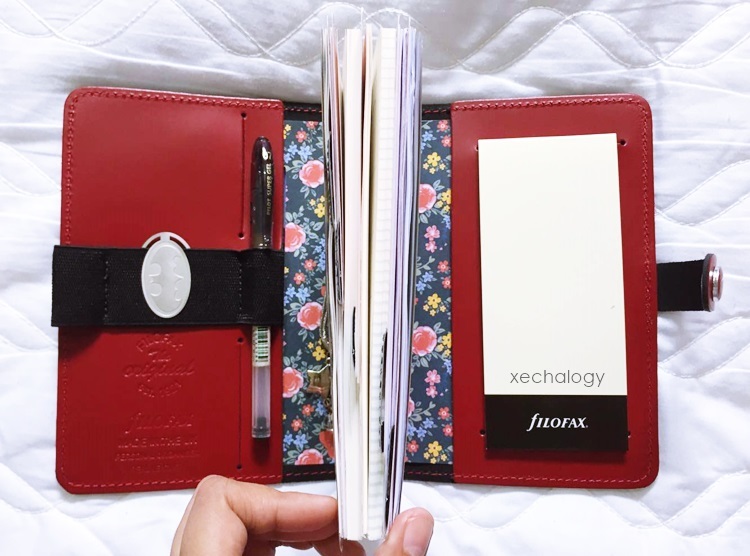 I have mentioned in my previous post here saying that I am waiting for my new Filofax and yes, it is finally with me. I am feeling overjoyed to finally own it yeay! 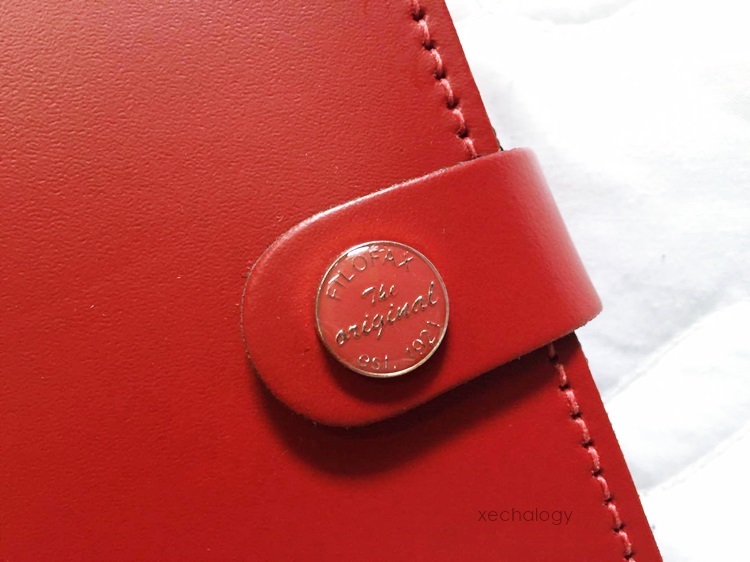 This is a Filofax Original in Pillarbox Red. I would say it is something like a dark red colour and vampire-ish. Other striking colours that they have in store are Lilac, Brown, Dark Aqua, Burnt Orange and Fluoro Pink but this one caught my heart. This is a close-up of the iconic design and feature of the button on the strap closure which looks retro cool and vintage! 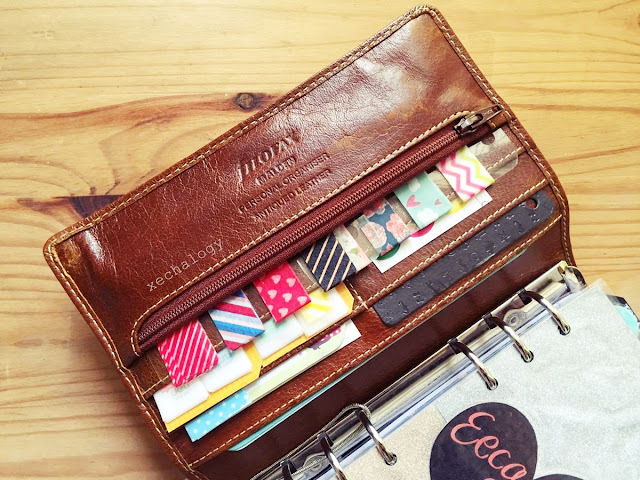 I would like to put a little bit history about Filofax that I take from their website which I find kinda interesting to at least know about the planner origin. 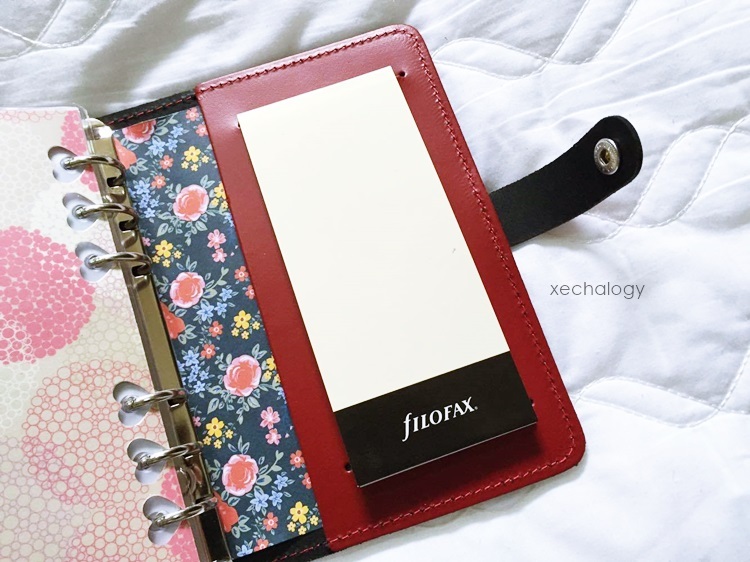 The beginning of Filofax started around 1910 originates in US where a Canadian Engineer named J.C Parker invent a system to replace the technical book that is too big to carry. In 1920, British Army Officer, Colonel Disney, comes across a Lefax personal organiser in the US and suggests that his friend, London printer William Rounce, launches the product in England. In 1921, Norman & Hill Ltd is set up by William Rounce and partner Posseen Hill to export Lefax organisers to England. 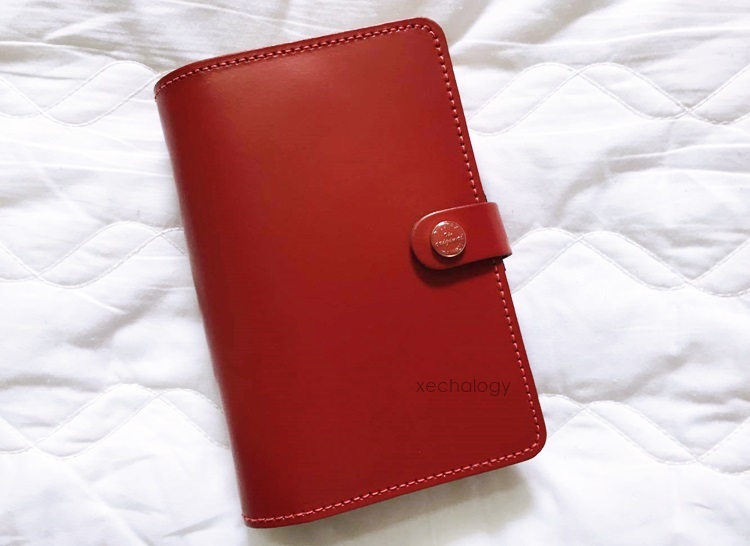 Temporary typist Grace Scurr suggests the organisers should be called 'Filofax' - derived from the term 'file-of-facts'. On 27th November, 1930 Filofax is registered as a trademark. In military circles, organisers are sometimes known as vademecums – Latin for ‘always with me’. This is an embossed logo on the inside front cover. I actually love to see this! Now let's go through the details. 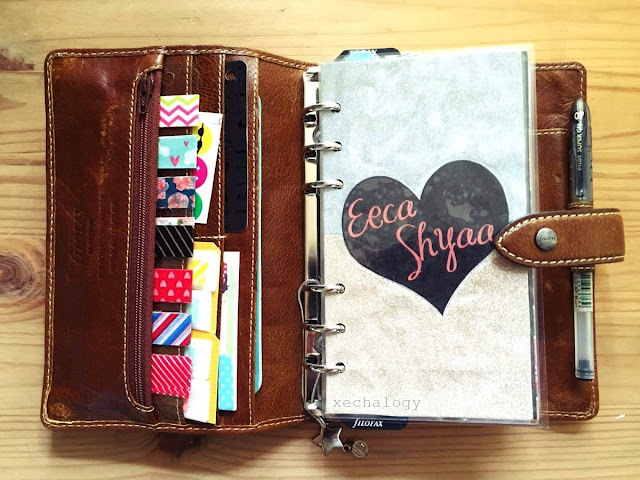 Filofax Original comes in two sizes which are Personal and A5 size. I prefer Personal size cause it is smaller than A5 and much easy to be carried everywhere and less heavy. 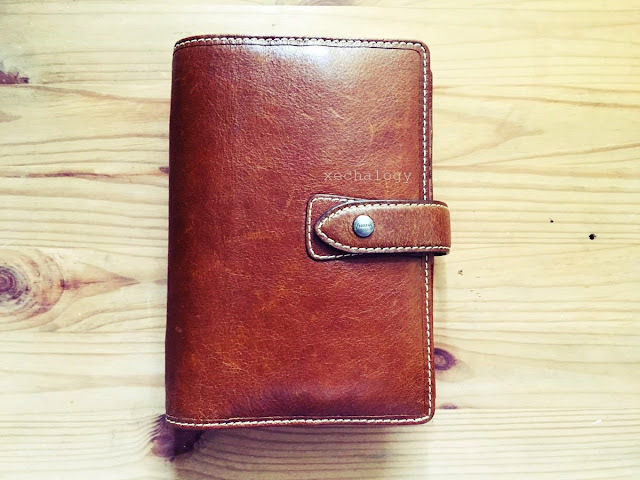 This planner is made out of a cow leather and the thickness is superb. Even though it might look stiff, it still lay flat! 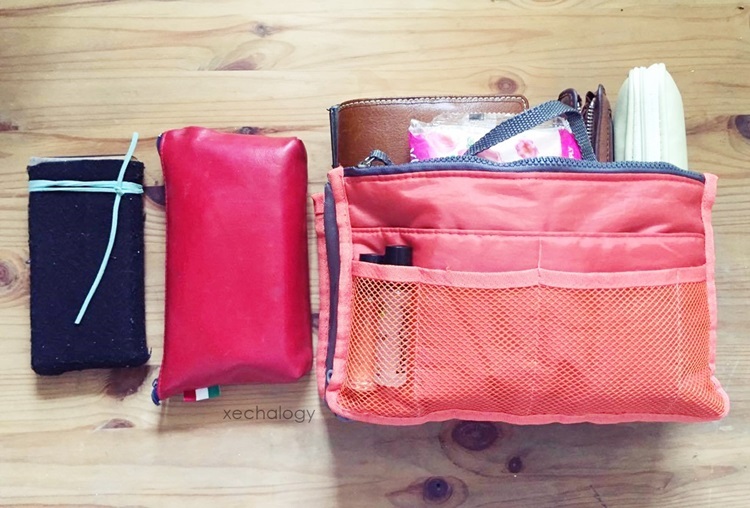 That black strap is a multifunction elastic holder and divided by three section. Yeah, you can put few pens there or anything you like but I decided to only put one pen on the loop. As the strap is quite short, you can't really have a so-called bulky planner. That's the cons, though. 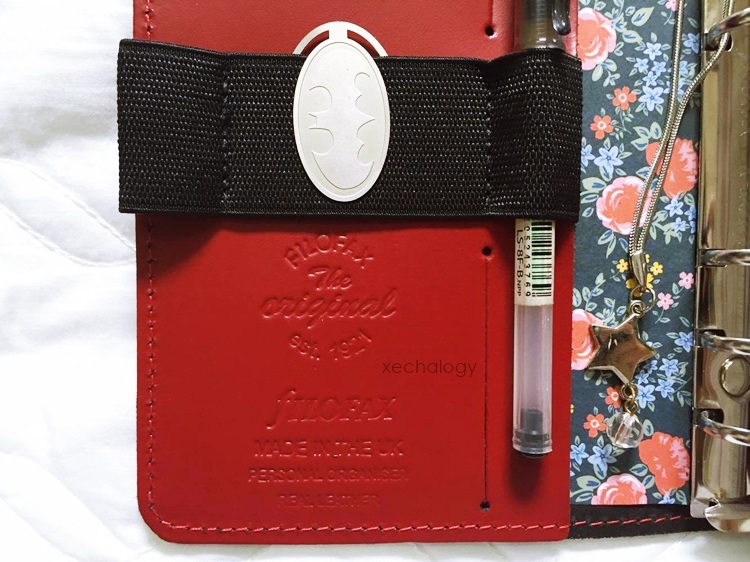 Filofax should lengthen the strap. As you can see in the photo, there are only two pockets there which is more than enough to me. This is at the back of the planner. 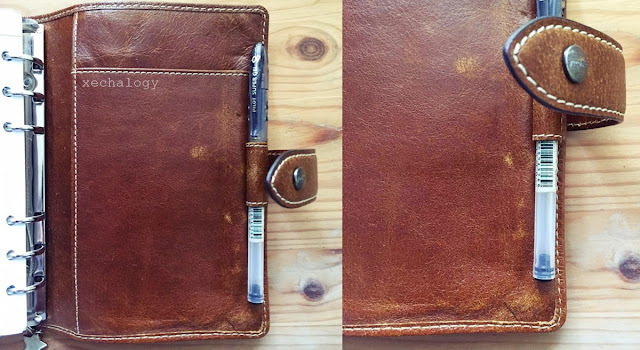 It's a free notepad stick to the pocket. The sweet torture is finally ended yesterday yeay! It takes forever waiting for the parcel to arrive and it is finally here. I guess shopping online is only for people who has an extra patience to wait without getting mad and worried lol. I love the packaging cause as you can obviously see, there are seven stamps on top of the box! 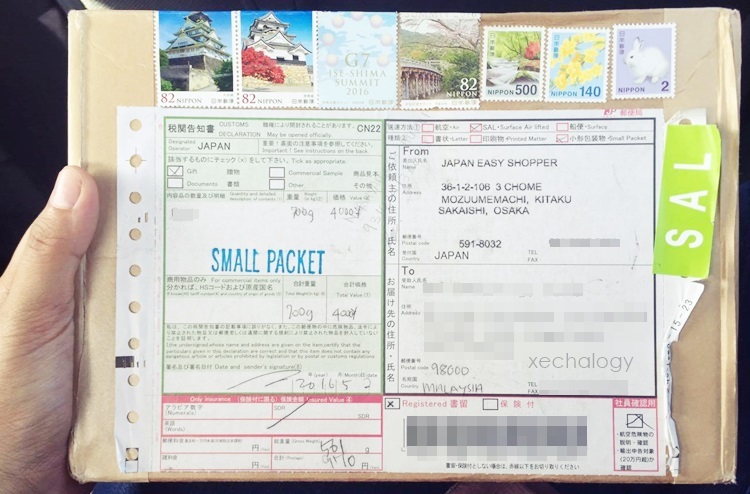 I'm not a stamp collector but I love to collect international things haha. I can't wait to post about the thing that hidden inside. As soon as I reached home yesterday, I tried to snap some photos but the lighting source from outside is getting darker which makes the photo quality a little bit off. I believe it's not only me but everyone wants their photos to look beautiful in their post heheh! I will reveal them by tomorrow for sure. I am always intrigued by what people have in their bag. Some people will only bring necessary kinds of stuff with them but some tend to bring everything that loads their bag so much. I am not sure in which category I fall into but people that know me told that my bag is kinda heavy as if I were bringing a tonne of stone lol. 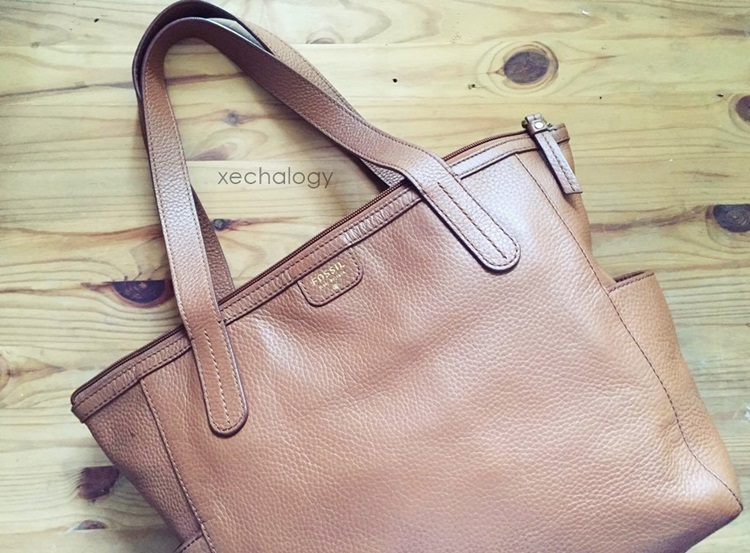 I am using an authentic Fossil Mimi Shopper Leather bag in brown colour. When my stepmother showed me this bag, I immediately fall in love with it and asked her to buy for me. But the heck, I thought it doesn't cost too much cause there's no way I am going to spend half of my salary for the handbag! But it's too late to cry for the mistake cause I had no choice but to accept this bag and paid for it. Ugh I should have seen the price first. She bought this online from @yurikahousemalaysia. Well, regardless of the price, it is somehow worth having cause the quality is super fine. But no, this would be the first and the last expensive bag I ever had. I am not willing to spend more on handbag unless if I am rich enough lol. As for details, this bag has two media pockets and one back wall zipper pocket inside, double shoulder handles and there is a fossil logo embossed logo tag on the exterior. 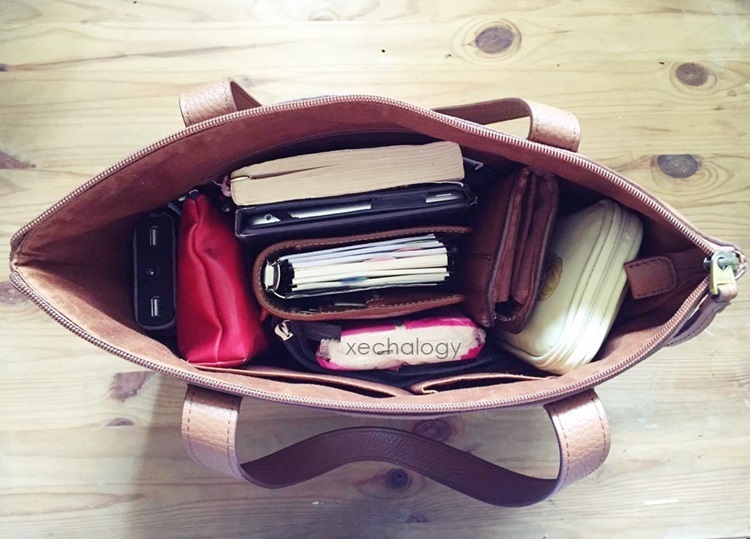 This handbag has less compartment. I am trying to make it as organised as possible so it won't look messy. 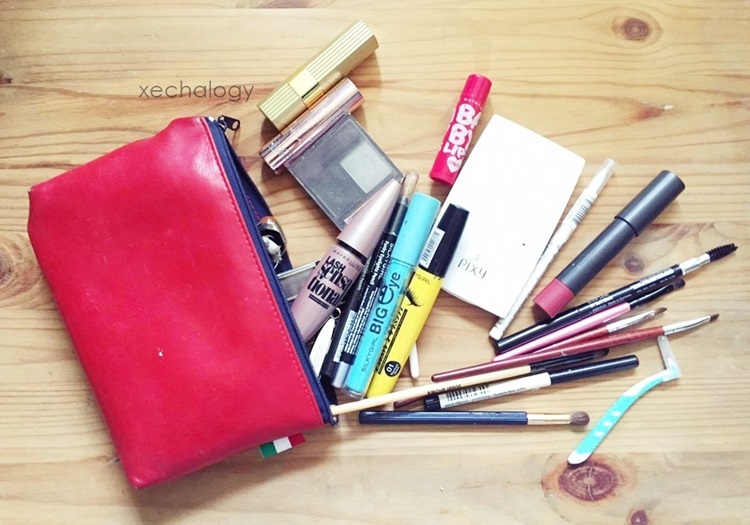 I used to just throw everything inside since it is very spacious but it turned out getting so bulky and small things such as keys or lipstick etc is unreachable. Tadaa! Is it too much or too little? Well, don't get surprised first! I only bring all this stuff to work only. 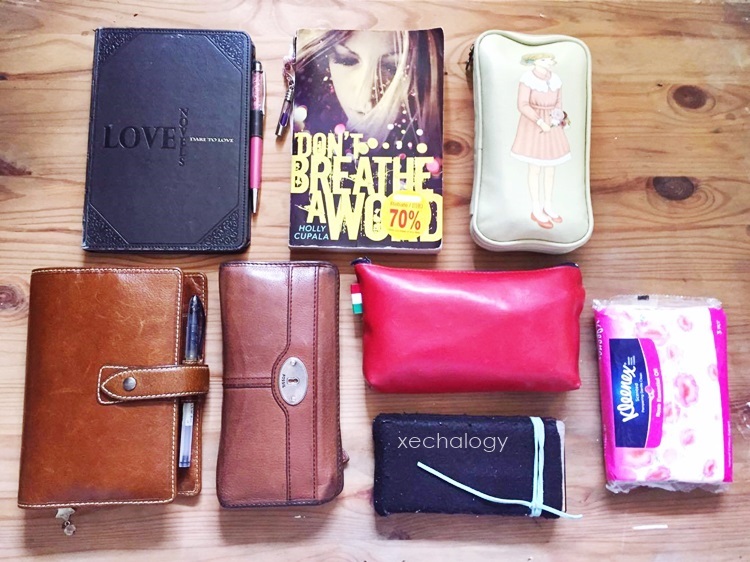 I have my iPad mini which the main purpose is to read the online books or to kill boredoms by playing games that I have downloaded in it, a novel to read when my smartphone battery is dead, pencil case with ton of pens, my Filofax planner to jot down everything and to make me stay organized, my purse, makeup bag, power bank and tissue paper. It's a big no to bringing all this thing when I am outing with friends or family. Gila kau berat nak bawak ke hulu hilir. I will use another bag and will only bring my purse, power bank, tissue and planner. Hiks. What is inside my pencil case? I am a big fan of stationery! And yes, I am a pen hoarder. 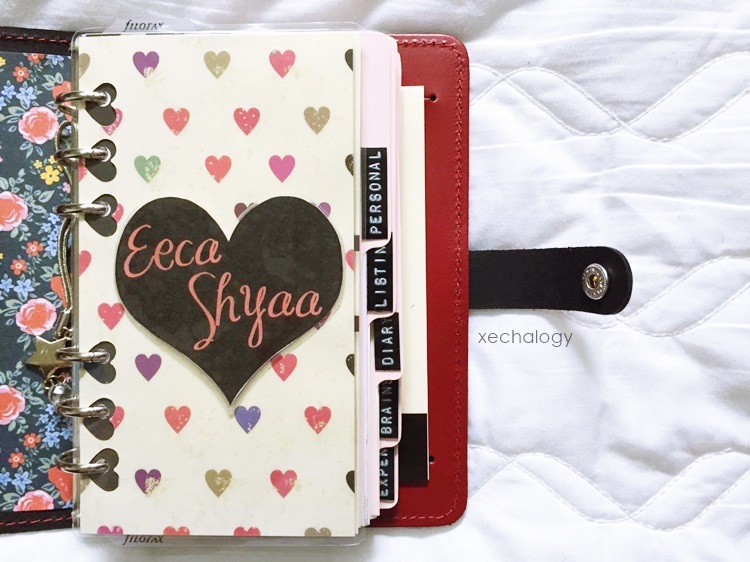 I left school almost for 6 years already yet I still collecting this thing :D I need this to colour code my planner! I bought the pencil case at a shop called Belle Bookshop located in my town. It's super cute and I love it! But sadly, it gets dirty already. As I mentioned early, the handbag has less compartment end I end up throwing everything in it. To solve the problem, I decided to buy the organiser to arrange my stuff nicely. I bought it from Popular which cost around RM30 if I'm not mistaken. Let's be organised, everyone! I know few people that tend to keep rubbish in their bag hahaha. Like receipt or used tissue etc. Well, I am a receipt keeper too but I keep it nicely instead of letting it crumpled at the corner of my bag! I never thought it would be very hard to find a topic to write on the blog especially when you don't really have a niche for your site. So, after wandering around over the internet, I finally decided to make this post. Yes, I am going to list out my all time favourite apps that I'm using in my baby smartphone! Did you use your phone wisely or simply carry it everywhere just to stay connected with your friends? Well, for me, it's not only about that thing. But it is more than that! As someone who loves to write in English, this application is seriously important for me. Other than helping me to find the meaning of a word that I don't understand, it also has a thesaurus option where I can discover a new substitution for a common word. If you are a student, I would strongly recommend you to download this app cause it is so useful! I believe everyone need this in their life smartphone. I am not an English native speaker. I need this to translate some Malay words to English for the sake of learning. Sometimes I am having a brain-lag where I can't recall few words in Malay and have to translate it from English to Malay. Dictionary helps me to satisfy my curiosity over words. This is a super great application for language lovers and those who want to study random course! It offers a bunch of courses that you can pick based on what you want to learn. It's free and portable. Seize the knowledge, people! Trust me, it will help you learning the language in an easy way ever. 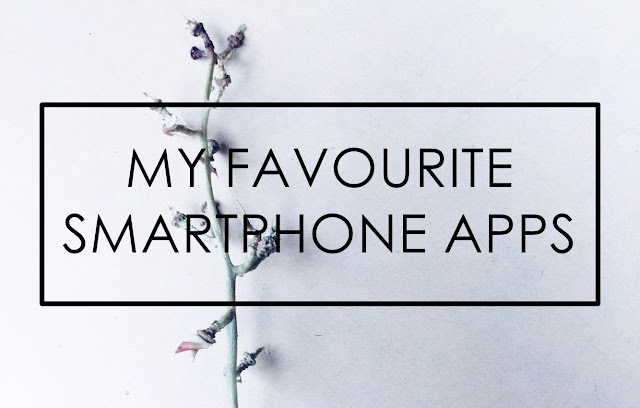 What I love about this app is it will allow you to download any pages on Google, no matter what it is and you will be able to read them offline. You can even save a pdf file! Trust me, everything in Pinterest is very useful not only to me but to everyone. If you are seeking for some ideas or wanting to be inspired, get into Pinterest and explore the site nook and cranny and you will find the things you are looking for. Have you heard about Ted? It is an app where you can watch talks/speech from some of the world's most fascinating people. The talks vary from educational radicals, tech genius, music, travel and other interesting things. I get addicted to this app cause I love to watch them speaking and giving talks in front of many people. It really inspires me. I'm pretty sure most people is using this app to have a great photo filter. So am I! If you know how to play with the filter scale, it will make your photo looks even more amazing! I have been a notebook lover ever since I was around 12 years old. I thought it is a low-cost hobby for me but I was completely wrong about it. As I grown up, I realised it's actually a catastrophe for my purse! I used to spend below RM15 to buy a notebook, but it's never the same now. The reason I said that because of this beauty Malden Filofax which has been a sweet torture for me! Look at how gorgeous it is! It comes in Ochre colour. It is not my first planner but it is my first Filofax organiser and the most expensive notebook I ever bought. To know the price you can simply visit their website HERE. 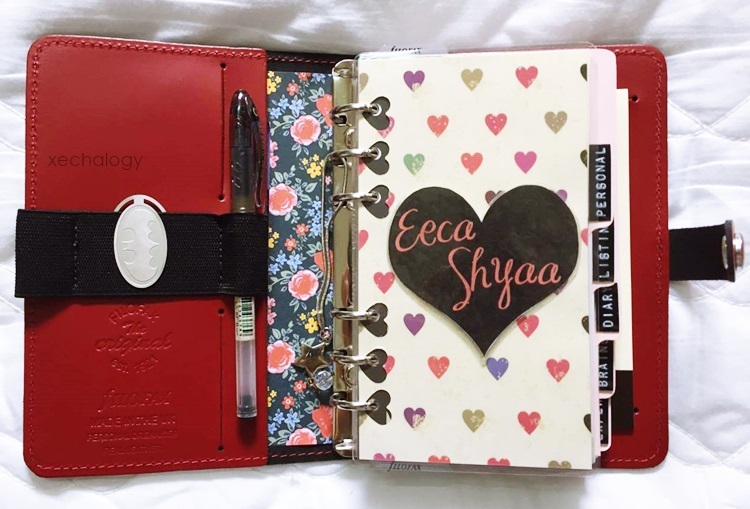 But I bought this preloved from someone in the PAM (Planner Addict Malaysia) group so its a bit cheaper. I am sort of a leather lover but no, I don't support leather production 100%! The first time when I received this organiser, I get so amazed by how superfine it is and the smell is somewhat nice and good! The material is from soft grain buffalo leather and I would say its really a good quality! I have been using this organiser since June 2015. 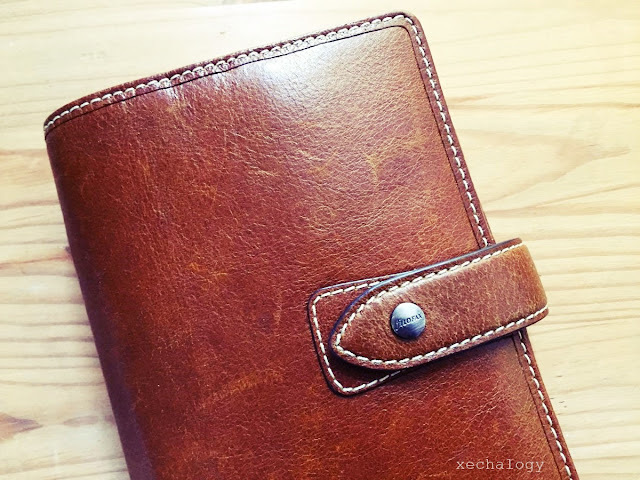 As you can see, there are 6 slots for a card or whatever you want to put it there and it is really accessible as the leather is extremely pliable. 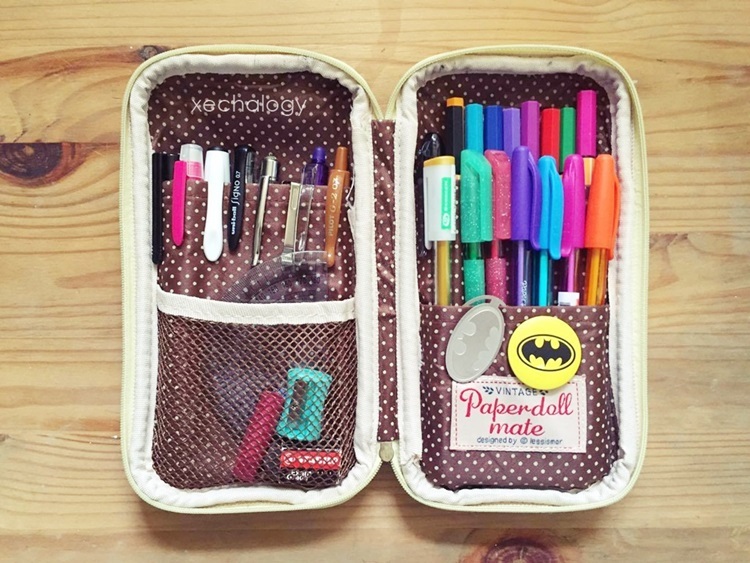 I am using the compartments to keep my portable washi tapes and cute sticky notes! The ring diameter for this personal Malden is 23mm which you can make it a little bulky or depend on how you would like to have your organiser be. As obvious as it is, my Malden cannot lay flat and most users are experiencing the same thing which is quite bothering for me. It would be nice if it can lay flat! 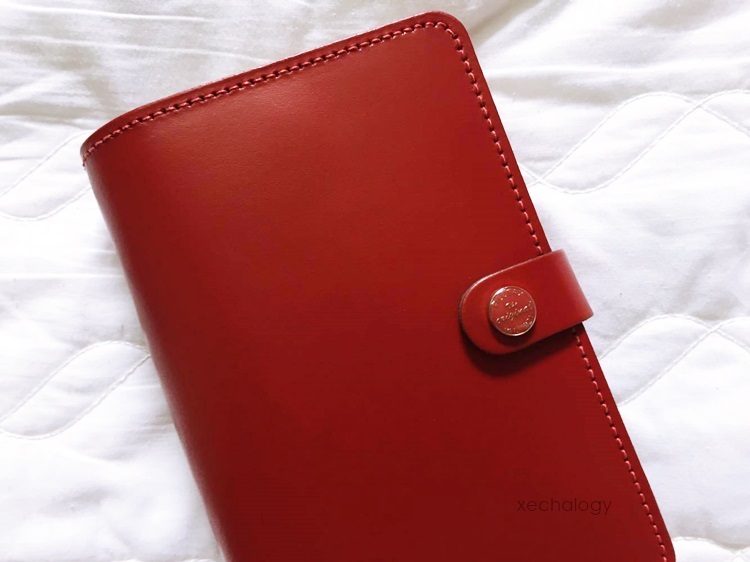 The usage of the planner is depending on yourself whether you want to make it more for business-like or for personal only. Can you spot the blemish? I am not sure why do it becomes like that but I guess it just the nature of leather. It has been said that the more you use, the better it looks. But I don't really like this turnout. It somehow looks like a defect skin. But despite that little thing, I am still in love with Malden! Born and raised in one of a division in Sarawak has made me a Sarawakian. Living for almost 23 years here, I am sad to announce that I still haven't got a chance to discover my beloved state yet. I never seen a long house for real and never been to rural area in my entire life. Yeah I know that it sounds pathetic. That is why a travel plan suddenly crossed my mind. But before proceeding to that travel whole thingy, lets learn a little bit about Sarawak first! Sarawak is also known as Bumi Kenyalang (Land of Hornbills) and one of Malaysian states on the island of Borneo. It's a largest state in Malaysia which is located in northwest Borneo, bordering the state of Sabah to the northeast, Kalimantan Borneo to the south, and surrounding the independent state of Brunei. Capital city of Sarawak is Kuching. Sarawak is divided into 12 divisions which are Limbang, Miri, Bintulu, Kapit, Sibu, Mukah, Sarikei, Betong, Sri Aman, Samarahan, Kuching dan Serian. Each division is then divided into districts and sub-districts. Sarawak has more than 40 sub-ethnic groups. Each ethnic has their own language, culture and lifestyle. Ain't that amazing?! (Honestly I only know Sarawak Malay regardless of the fact that I am actually half Melanau) Major ethnic groups are Iban, Malay, Chinese, Bidayuh, Melanau and Orang Ulu. Sarawak people is practising a variety religions such as Islam, Christian, Buddhist, Chinese folk religion which is Taoism and Confucianism and also Animism. Among all religion, Christian is the highest belief in Sarawak followed by Islam and Buddhism. It is the only state in Malaysia where Christian outnumbers Muslim. Despite the distinction of religion and culture, Sarawak is still able to maintain the peacefulness and harmonious between the people regardless from what background they are coming from. The main language is Bahasa Sarawak (Sarawak Malay) which has a different dialect from spoken language in Peninsular Malaysia. Iban language is also widely spoken among people in Sarawak. Other than that, Bidayuh language has six major dialects which only spoken by few while Orang Ulu has about 30 different dialects But based on history, English was the sole language in Sarawak and has always been the official language. Have you gotten enough with this bits and pieces about Sarawak? I would say that my beloved state is really unique as the diversity of the ethnics and cultures has made it special and one of a kind! You gotta to hold on as I will write more about Sarawak especially about foods and its hidden gems!. I really wish I could visit the places by myself so it would be easy for me to be a storyteller. P/S: If there's something somewhere wrong in this post, please tell me in a proper way. Thank you!